What an exciting day this has been for Gunner and all the people who have prayed for him and donated funds to help with his expensive medical bills! His pain, surgeries, infection, grueling daily dressing changes, hydrotherapy and laser therapy are all behind him now! Although we do not know any of Gunner’s past history, beside being a stray, we know he has not had any training and sorely needs it. Much …thought was given as to placing Gunner into an environment where he could receive the training and TLC he needs to become a well rounded and highly adoptable dog. Huskies are a very intelligent breed and require their “people” to be one step ahead of them. 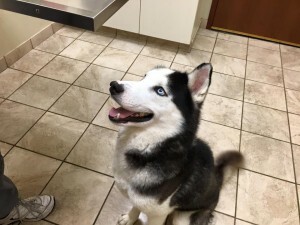 We were able to connect with “ADOPT A HUSKY,” a foster based rescue that has the expertise to foster and train huskies and eventually adopt them into a forever family who is familiar with the breed. Yesterday, Noelle, a trainer/foster from ADOPT A HUSKY met us at Midwest and spent a great deal of time working with Gunner. Noelle has been training huskies for many years and has expertise in husky sledding as well. She found Gunner to be a highly intelligent husky who is responsive to training and wants to learn. He does display some “adolescent” behavior due to his young age but by the time she had to leave, Gunner had learned several commands and was very respectful of Noelle. Per Noelle, “as huskies go, Gunner will train quickly and is highly adoptable.” As much as we would like Gunner to stay at PAWS and find him a forever home, living in a shelter is not in Gunner’s best interest. Placing him in a breed specific foster home with a trainer is what Gunner needs and deserves–the best of the best!! So, off to his new foster home he will go!! I wish all of us at PAWS could have met Gunner to see what a survivor he is and to see how forgiving he is despite his past. It is time for Gunner to pack his bags and start a new life. He is a beautiful dog with beautiful blue eyes that now sparkle!! My only concern is that I sure hope whatever foster home Gunner goes to, that they live near a Portillo’s—-Gunner loves their chicken tenders! !